These were some of the first Blessed Coast mixes to touch the streets. The first one "St. Croix Massive" was mixed & compiled by Governor Lee following an extended visit to the VI back in 2005. I believe this wast the first time St. Croix music hit the West Coast (correct me if Im wrong) when we sold these mixes at Reggae on the River in 2006... The following year was when we all first heard and saw a lot of the artists on here.. This mix is timeless... Mixed live, 1 take on 2 CD turntables..
As a follow up to "St. Croix Massive" we released "Trinidad Massive" which was along the same lines.. Some great early works by Marlon Asher, Khari Kill, Jah Bami, Prophet Benjamin & more.. This one was compiled & mixed again live one 2 CD turntables by Jack Riddim (Formerly of Blessed Coast now founder of I-Dwell Records) & Lionize. OH MY GOD!!! 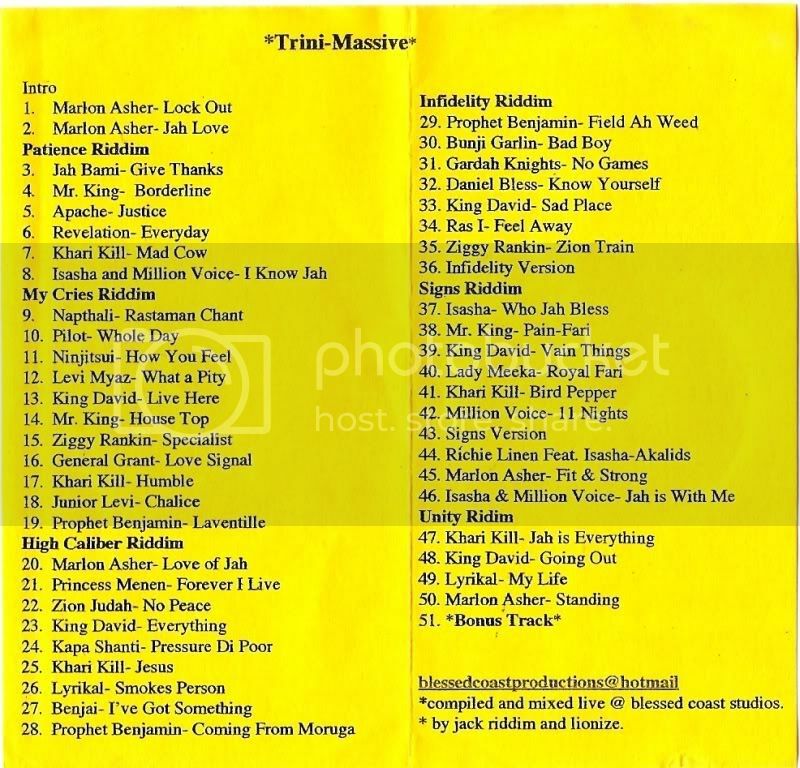 I have been looking for the info for that trini massive mix for years!!! its been passed all around my circle and yet nobody knew who made the mix, tracklist, anything about it. bigup yourself blessed coast massive!!! big mix!! I put him in touch w/ nuff artist and djs and before the year was out he was living in st. croix, doing the works...re-releasing Sabbattical order's original album and then going on to link with everyone and everyone and releasing those BOOM mixes. Yes Binghi, we remember dat. We continuously bumped into nick for years to come after that (he would come back to the states w VI artist on tour). We remember meeting you same way and have rated you as an artist and an individual from day one! A we say "Binghi Coast" 2 d world! Niceness! I have been playing the St. Croix cd since waaaay back. Such good vibes from start to finish. The tuffest track on the album is #3 Empress ? "worry no more"
Isn't dj Gov. Lee from the Dynasty crew (Bainbridge)?? Big respect for re-upping a dis one, download if you don't have it NOW!! zahir.. didnt you make the same style mixes circa 2004 - 2005 ? i remember picking these up at trr about that time.. Respect SpliffP!! Heres some background on Governor Lee.. Yes Bainbridge Island crew, part of the Dynasty family and as of this year officially part of Blessed Coast Sound but the link goes back over a decade..
"Recently added to Blessed Coast Sound, Governor Lee met Ryan-I in 2001 in Seattle. After traveling to St. Croix & Miami over a period of a decade he returned to the North West with an East Coast flavor that brought some new hype to the sound. 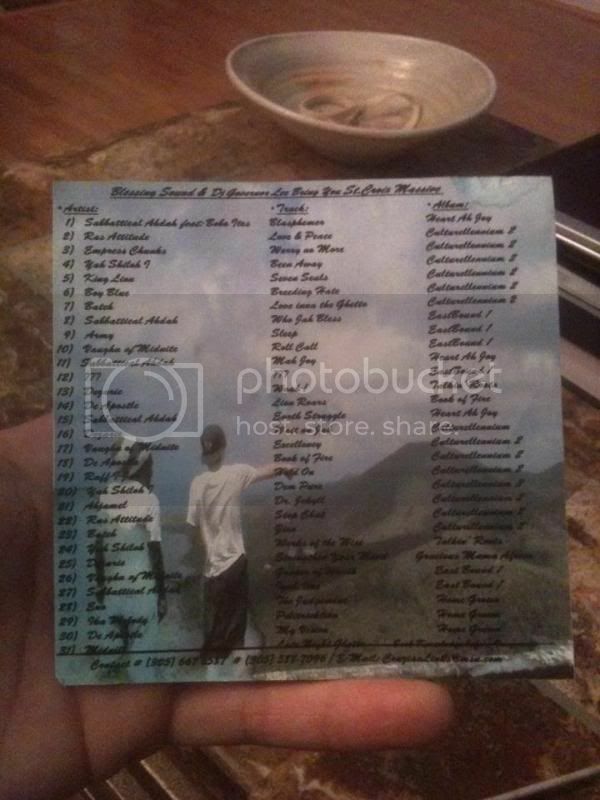 He released “St Croix Massive,” the first %100 St. Croix mix CD that is still a favorite amongst Blessed Coast Family. With experience not only in music, he adds an element of Film, Photography & engineering that has brought Blessed Coast Sound to another level." OMG these CD's are amazing! Thank you so much for making them available to download. I feel like my life is better for having them. i ran this mix(the stx mix) while working out today.. it definetly put some inspiration in my steps today.. i would also add, as with zana, that my life has been made better from this mix..
the trini cd is equally as nice.. just that the stx mix hit me somewhat hard today..
i hAvent listened yet but i know this mix. i ve been trying to find this one song for ages. i used to hit repeat all the time. It starts off with rain in the background....in the chorus is "give me the weed." I know u know it. who is it? whats the name of the song? the STX cd getting nuff run today.. Thanks blessed coast I think u r right..."been away" a long, long time.....I don't know how to find it but now I know who sings it and what its name. The mix has been loaded up to Soundcloud so you can listen from anywhere there is internet --> Enjoy! the latest set of blessed coast mixes are straight burners..
west coast runs it when it comes to this revival thing. Yes I. Massive RASpect. Give thanks for reposting the new link. Listening now. "COME OUTTA MI WAY!! ZION WE A GO!!!!!!!!!!!" Love these mixes. We listened to them on the drive up to SNWMF this year. If you loved those mixes chances are you may like this one as well!! those vinyl mixes are fire as well.. i have been running those non-stop this week.